Explore locations around the battlefield! The statues of Monument Park loomed above Paladin as he ran for cover. Their somber poses were illuminated by fixed lights and the occasional explosion from Mauler’s grenade launcher. The masked mercenary laughed as he launched another round in Paladin’s direction. “Just think, Paladin. If I hit you with one of these maybe you’ll get your own statue too!” Mauler teased. Paladin emerged from cover to fire several rounds at his opponent as he sprinted towards the base of a statue. As Paladin focused on engaging the enemy, his foot passed through the laser tripwire mounted on the ground. In an instant, the monument behind Paladin flashed brightly as the remote charges affixed to it detonated. Paladin was trapped underneath as massive chunks of the three-story-tall statue crumbled to the ground. As Mauler cautiously moved through the rubble and debris to locate his target, he was suddenly blinded as a wall of hexagonal shapes appeared before him. 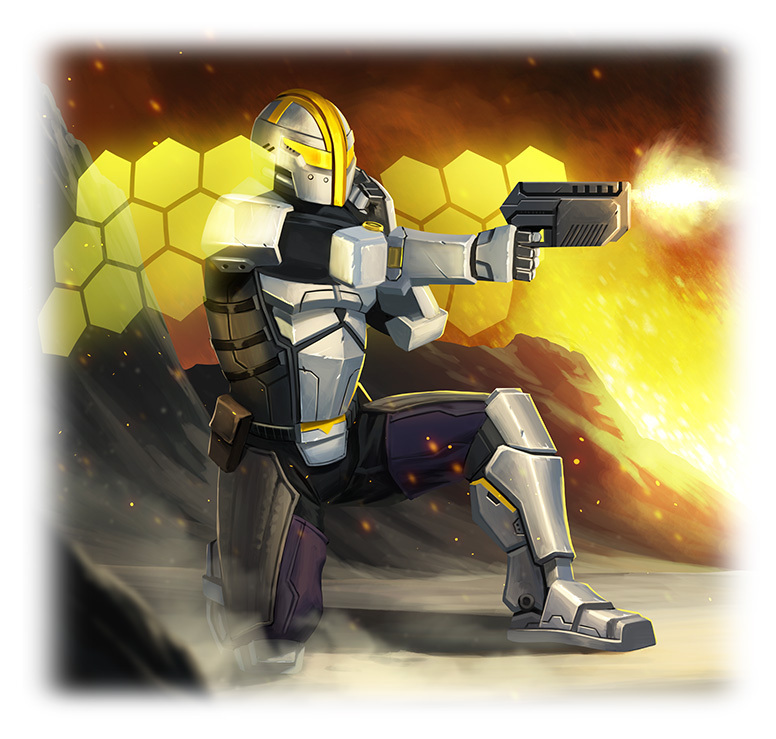 Standing beneath the barrier was Paladin, unharmed by the debris. Welcome back to another preview for Guardians! 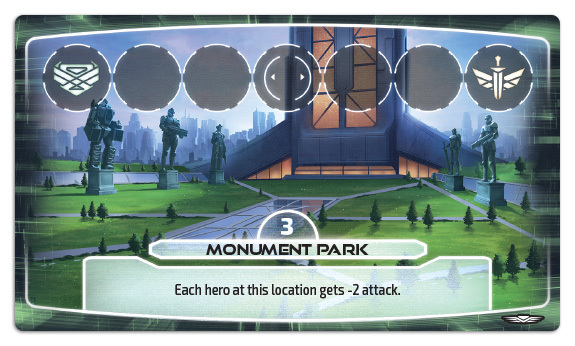 This week we’ll be focusing on location cards and how they form the battlefield of each game. Be sure to check out our last preview which covered heroes and their corresponding power cards. Once you’ve chosen your team, it’s time to take the fight to your enemy and claim as many locations as possible. Remember, each location is worth a certain number of points, and the first player to reach nine points is the winner! Let’s take a closer look at location cards. Now we reach the most important part of any location card - the control track. The control track represents your team’s hold on a location, how established their presence is, and how entrenched they are in that area. There are several ways to move a control token at a location which we’ll explore in detail in a future preview, but just know that the goal is to move the token all the way to your faction’s control space. If any location has it’s control token on a player’s faction control space during that player’s score phase, she may add each of those locations to her scoring area. If a player ever has 9 points worth of locations in their score area, they immediately win! 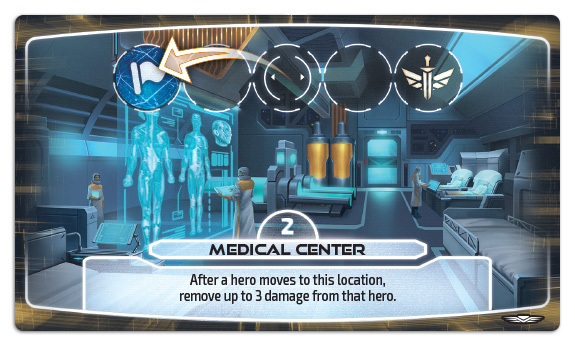 Once a location is scored, a new location is dealt out to replace it from the location deck and a control token is placed in the center space of that location’s control track. You’ll explore all sorts of strategies and combos as you work to wrestle locations from your opponent in Guardians, so be on the lookout for the best location to make your stand! Guardians is available for preorder here and will be hitting retailers and our own webstore later this year!